Ignore the Godless Grinches. Jesus is for Real. 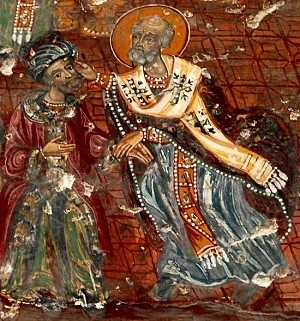 Slapping down heretics: St. Nicholas, the prototype of Santa Claus, got away with it at the Council of Nicea. But I wouldn’t recommend it nowadays—no matter how provoked you feel. Washington Post: Did historical Jesus Really Exist? The Evidence Just doesn’t Add up. Washington Post: Forget Santa Claus, Virginia. Was there a Jesus Christ? Golden-throated crooners may tell us it’s the most wonderful time of the year, but informed Christians know better: The approach of Christmas also means the emergence of anti-yuletide cranks. And this December the godless grinches seem more visible—and crankier—than ever. There’s the American Atheists with their now-traditional billboard intended as a metaphorical poke-in-the-eye to theists just trying to enjoy some holiday cheer. Meanwhile, on public spaces from Florida to Chicago, the more sophomoric proponents of the First Amendment can’t help but use their freedom to taunt believers with bizarre displays including a flying spaghetti monster and a stack of Pabst Blue Ribbon beer cans. But the most audacious attacks against the season are now coming from deniers who aren’t content to say God was never incarnate in a babe called Jesus. They’re insisting there never was a Jesus to incarnate. One such critic is Raphael Lataster, a lecturer at the University of Sydney in Australia, who summarized his view in a recent Washington Post column. Lataster, author of There Was No Jesus, There Is No God, argues that once the religious evidence is dismissed, the paucity of purely historical facts raises serious doubt as to whether Jesus of Nazareth ever walked the earth. Now, for those of us merely wishing to share “good tidings of great joy,” this is too much. It’s one thing to argue that Jesus was less than divine; that history doesn’t support New Testament claims of a messiah who performed miracles to testify of his heaven-ordained mission to atone for the sins of man and reconcile their souls to God. It’s quite another to defy conventional wisdom and say that the Jesus so many revere is no more than a fraud or delusion. And Erhman is right, especially considering how Lataster apparently is blind to the irony of his own position. As we’ve already noted, he begins by discounting religious chroniclers of Jesus as unreliable, because, he says, these authors were metaphysically biased. But then, so is he. But as amusing as it is to point out Lataster’s hypocrisy in this respect, ultimately it’s not that important. We all have peculiar starting points for getting at the truth; the important thing is that we recognize the truth once we finally encounter it. And the truth is that Jesus was—and is—real. Of all the evidence for his existence, two items stand out: The church and the New Testament scriptures. As for the first of these, the collective body of believers in Christ, it has endured for two thousand years. What’s more, through several epochs of its history the church has prevailed despite determined efforts to wipe it out. It is extremely unlikely, then, that a movement so vibrant and tenacious could be founded on a non-entity. The New Testament writings as well offer profound evidence in favor of Jesus. To begin with, their provenance is outstanding. There are far more manuscripts of New Testament books, from much earlier dates, than for any other ancient literature. The earliest fragment of the Gospel of John, for instance, dates at least to the first half of the second century, perhaps even to the late first century—a few decades after Jesus. The first complete copy of the New Testament dates to the fourth century. In contrast, the earliest manuscripts of Caesar’s Conquest of Gaul, probably written around 50 B.C., date to the ninth century. What’s more, the gospels and Acts offer no nebulous accounts of some rootless mystic and his benighted followers. They are filled with specific details; they name prominent people, identifiable places and distinct chronologies. Again, despite what Lataster claims, the gospel writers certainly describe Jesus as more than some mere phantasm. Transcendent, yes; God, yes; but also a flesh-and-blood, wholly physical reality present in human time and space. Ultimately, then, the issue is not whether Jesus existed, but what to make of his message. We’ve noted how he claimed to have been sent by his heavenly father to die as an atoning sacrifice for sin. But that’s not all. Jesus’ mission then, was not just to provide spiritual deliverance. His hand-on, historic ministry to heal the sick, free captives, and champion the poor and oppressed happened even as he fulfilled his unique and deeply mystical role as redeemer. And through his followers the work of Jesus continues, a truth desperately needed even as the world grapples with news of students murdered in their place of learning, of young women kidnapped and sold as slaves, of racial strife and tottering economies. Indeed, in the midst of all this mayhem Jesus remains “our glorious hope.” Christians celebrate Christmas in memory of the promise realized by his birth two millennia past. And we look to his second coming as the culmination of the justice and peace he pledged to deliver when he sojourned among us. Which leads us to this final question: If the godless grinches had their way and ultimately erased Jesus from the picture, what hope could they possibly offer in his stead?